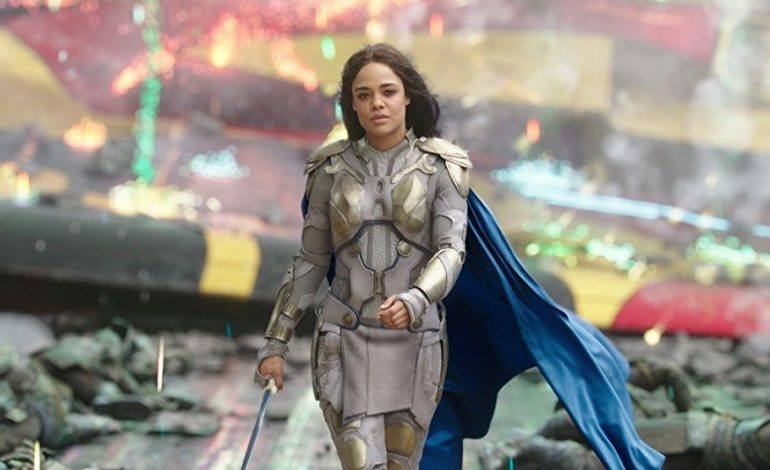 Tessa Thompson, on Twitter, shared a spoiler for the fate of her Thor: Ragnarok character, Valkyrie, in Avengers: Infinity War. She revealed, through an image of Bucky Barnes (Sebastian Stan) holding a goat, that Valkyrie doesn’t appear in the third Avengers installment. The story here is that, back in March, someone made a parody Twitter account comparing Thompson to goats that supposedly look like her. “Me in Infinity Wars,” Thompson tweeted as the caption to the Bucky-and-goat image. It’s implied that Valkyrie dies at the beginning of Infinity War, but her body never appears on-screen, so it’s unclear whether she survived Thanos’s attack on the Asgardian refugee ship or not. Given the tendency for superheroes to bounce back from the brink of death, Thompson could still appear in future movies. If you’re disappointed that Valkyrie didn’t get a role in Infinity War, or you’re just a fan of great music and great visuals, you can catch Thompson in the forty-minute “Emotion Picture” for Janelle Monáe’s new album, Dirty Computer, on YouTube now.